Winstons score B+ a fresh voice from an emerging country in translation in English , owes much to Marquez but worth reading. 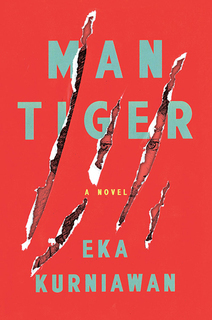 Eka Kurniawan had been on my radar since his first novel beauty is a wound appeared last year, so when the second book by him Man tiger appeared on the man booker I was pleased to get the chance to add Indonesia to the list of countries this blog has covered. Eka Kurniawan grew up in a small coastal town and studied philosophy he is also a graphic designer. Also in the introduction to this book there is talk about how Eka discovered books and the two books he loved that of Gabriel Garcia Marquez and the old crime novels of the detective Nick Carter. Boar hunting had become their pastime many years ago, back when Sadrah was still the town’s military commander. Anwar Sadat himself had always been highly enthusiastic every time the harvest season ended, when people were no longer bound to the soil, which was left fallow temporarily. Although he had never raised a spear or run up and down the hills, he always provided boxed meals of rice and fried egg and a truck to take the hunters to the jungle’s edge. Three times a year they enjoyed this sport, going on the season’s non-stormy Sundays. Between hunts they would tame ajaks and train them to course their prey. Anwar like Margio was a hunter as well . I don’t often read introductions to books but am pleased I did to this one as it placed the work in context to me. Baring in mind the book is 11-year-old, its safe to say this is a book written firmly under the spell and style of Gabriel Garcia Marquez. If Marquez had grown up in a small coastal town in Indonesia this is possibly the book he would have written. Man tiger follows, the death of Anwar Sadat (am I the only one that find it is strange the choice of a Egyptian president that also like the main character in this book is shot) . Now this is a not a who dunit as we know who shot him it is more a whydunnit in a way.Anwar was shot by Margio a young man with a white tiger as a friend whose famlies past has often crossed with the womanizer Anwar Sadat a failed artist. What drove the young man to kill the older man who had been a thorn in his families side for so long. Margio talks about the tiger also being inside him. I loved the atomsphere of this passage it evokes the place so well . I enjoyed this As I said it remind me of Marquez but also of Classic crime from America where it isn’t always a whodunnit but more of whydunnit as I said this also harks back to the classic crime novels of Latin America where it is more about the scene than we in the uk have to try to find out who did the killing. We also have a trying to pay himage to Marquez without going full magic realism in a way lots of talk about having a tiger in a man but no men becoming tigers here bu the lines nearly get blurred at times. I do wonder about the chhoice of Sadat as a name is that a wider comment on his homeland it wasn’t til 2004 when this book was published the country had its first free presidential election.Well will it make the actual shortlist I think so our I am not sure it is close this year I think you will have to wait to tomorrow and the Shadow shortlist is announced. I have now reviewed all this years longlist.